The third in our regular series looking at hot topics. Deliberately provocative, we're trying to start a debate. January and February, the start of a new year, and the time most protection providers share some great news with the rest of the industry. Everyone rushes to publish their claims statistics. Holloway Friendly led the charge this time, getting their numbers out into the trades within the first few days of 2019. And most of the statistics make for positive reading. Life, critical illness and income protection claims paid well into the 90 percents. It’s great news and something the industry should feel proud of. But overall, we only publish these statistics in trade publications and on our own websites. We are effectively telling each other what we already know. That we DO pay out. Most don’t read financial trade magazines. Few visit the news pages of protection provider websites. And sadly, many people are still under the impression that life insurance companies DON’T pay claims. They may have read articles in the Daily Mail and other papers taking product providers to task over declined cases. And because there aren’t loads of articles talking about the 95% of polices we do pay out on, the man on the street thinks the number is considerably lower. General insurers seem quite happy to advertise their similarly impressive claims statistics on TV. And to shout about them in consumer media. But generally, in the protection market, we don’t shout about these impressive numbers outside the confines of our own industry bubble. Why not? Why aren’t we reaching millions of families every year telling them we pay most of all claims. 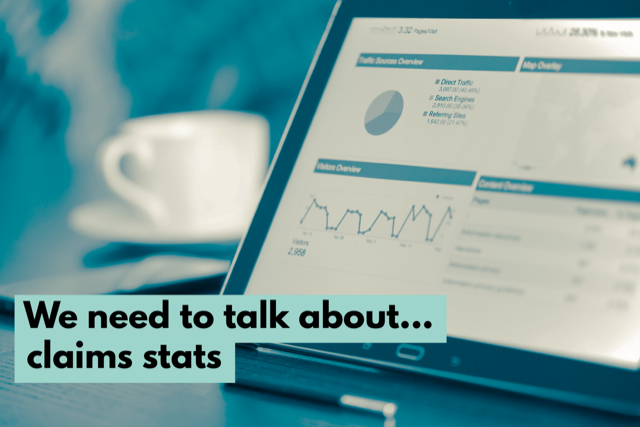 We’ve heard assorted reasons why we don’t publish statistics wider. People won’t believe them. They won’t understand them. We don’t want league tables. We’ve even heard people say there’s no point advertising statistics because people don’t understand percentages. We think this is nonsense. We should be shouting these figures from the rooftops. And combining them with case studies to increase the number of positive stories out there on the internet. Despite a few good efforts, there aren't nearly enough case studies. If we communicate our stroies and numbers more frequently and to a wider audience, then eventually the positive stories will drown out the negative.